"What do you think are the top two problems with the nation's medical care system?" In a June 2009 survey, approximately one thousand Americans were asked this question. Over half the respondents cited cost as one of their top two concerns. This mirrors results from April 2007 and March 2008, when the same question was asked to a different group of people, but the same answers were given. Costs appeared in various guises-from concern about prescription drug prices and the high costs of hospital and physician care to overall insurance costs. One way or another, the price tag of medical care is what worries people most. Access comes in second. One-third of Americans worry about people who do not have insurance coverage or people whose coverage is not sufficiently generous. The third concern is the quality of care. One in ten people cite poor service, lack of quality health care, or other quality problems in their top two agenda items. Cost, access, and quality are not just what Americans fear about health care, but also what experts highlight as the core issues in our health care system. Analysts from both the Left and the Right decry the high cost, limited access, and haphazard quality of American medicine. According to an article written by Stuart Butler of the right-of-center Heritage Foundation and Henry Aaron of the left-of-center Brookings Institution, "For at least 20 years, commentators have bewailed the lack of adequate health insurance among growing numbers of Americans. For an even longer time, analysts and experts have warned that health care costs were rising unsustainably. Yet no consensus has formed on what to do about these twin adversities. . . . Meanwhile, the ranks of the uninsured swell, health costs soar, and states and businesses cut benefits." Indeed, these two analysts even wrote a paper together, arguing for liberal state experimentation to address these problems. Politicians heard the message. The much-maligned health reform bill of President Obama's first term, colloquially known as "Obamacare" but officially named the Patient Protection and Affordable Care Act-or simply the Affordable Care Act, as I shall call it-was designed by President Barack Obama to address these issues. As President Obama said when introducing his health care legislation, "The plan I'm announcing tonight would meet three basic goals. It will provide more security and stability to those who have health insurance. It will provide insurance for those who don't. And it will slow the growth of health care costs for our families, our businesses, and our government." And though Republicans criticized the legislation, they did not attack those goals. According to Mitch McConnell, the Senate minority leader, "Look, nobody is satisfied with the healthcare system as it is. We've got serious problems that need to be addressed. Costs are out of control. Too many people are being squeezed out of the market. . . . We can do better. We can expand access to people with preexisting conditions. We can keep people from being kicked off their plans. We can lower costs and premiums. We can do all of these things without undermining the things we do best and without raising taxes that kill jobs in a bad economy." Politicians know what people want, even when they can't convince people they have the answers. Cost, access, and quality all need to be addressed. But these problems are not equally difficult to solve. Start with access. Fifty million Americans have gone without insurance coverage for the entirety of a year, and about as many are uninsured at some point during a year. That means that every year, one in three Americans experience some sort of an uninsured spell. Uninsured people are without coverage largely because of affordability and accessibility issues. The dominant response of the uninsured, when asked why they don't have coverage, is that they cannot afford it. In addition, many uninsured do not even know how or where to buy coverage. The affordability concern is particularly salient because health insurance is so expensive. The average cost of a family health insurance policy is about $15,700, and a single policy is about $5,600. That is an enormous hurdle for all but the highest-income families. On top of the large number of uninsured, even those with insurance feel insecure: they worry that their insurance will not cover the services they need, their premiums will increase if they or a family member gets sick, or they will be dropped from coverage entirely if their income falls (perhaps because they lose their job) or their medical bills rise. These access issues have real consequences. Twenty percent of people indicate that there was a time during the past year when they or a family member needed medical care but did not receive it; the most common reason is financial. And the Institute of Medicine estimates that 18,000 deaths per year could be avoided if everyone had insurance. Given the grave results of lack of access to care, it is ironic that covering the uninsured is not nearly as difficult as many believe. Some type of subsidy or tax credit is needed to make health insurance affordable for those with moderate incomes. In addition, a (virtual) location needs to be established where people can shop for plans. In fact, designing a tax credit for health insurance is relatively straightforward: such a credit would pay for nearly the full cost of health insurance at very low incomes and phase out as income increases. This is how virtually all proposals for expanded health insurance coverage have operated over the years. The conservative Heritage Foundation, which has pushed for an individual health insurance system for as long as any group, proposed a subsidy system like this in 1989. Governor Mitt Romney and the Democratic Massachusetts legislature agreed on a specific formula in 2006. The Affordable Care Act (ACA) put it into federal law. The ACA has two related coverage processes. Medicaid, the existing federal and state program for the less fortunate, will cover the very poorest Americans. Under the Affordable Care Act, all nonelderly American citizens and legal residents whose income is at or below 133 percent of the poverty line (roughly $30,000 for a family of four) would become eligible for Medicaid. Because of their particularly low incomes, coverage for this group will be free. As interpreted by the Supreme Court, states can choose to expand coverage in this way or forgo the expansion. Assuming that all states proceed with the expansion, an estimated 17 million people would be added to the program, on top of the approximately 35 million nonelderly people expected to be covered without reform. The other coverage process applies to families with incomes above 133 percent of the poverty line that do not have employer-based health insurance. These families will receive sliding scale tax credits to purchase insurance. Table 1 shows the amount that families would pay and the corresponding subsidy. The lowest-income families-those earning between 1.33 and 1.5 times the poverty line-would pay 3 to 4 percent of their income for coverage, or about $1,100. This share increases to 9.5 percent of income for families earning up to four times the poverty line (an income of about $88,000). A family at four times the poverty line would pay about $8,400 for insurance and receive a subsidy of about $6,600. Above 400 percent of poverty, there would be no subsidy for health insurance. People would receive these subsidies to buy insurance through an exchange-an online brokerage for health insurance run by state or federal governments. In 2016, the exchanges are expected to process insurance for 21 million people. As noted earlier, this system is not hard to design. Versions of such a scheme have been floating around for years. The major issue with the program is funding. The median family in the United States earns $50,000 annually, roughly 250 percent of the poverty line. Thus credits would be available to individuals well into the upper half of the income distribution. This is expensive. Table 2 shows the financial consequences of this commitment for the federal government. The coverage provisions of the Affordable Care Act take effect in 2014. To avoid phase-in effects, I show the costs in 2016. The left-hand column shows the money spent under the Affordable Care Act in 2016 and the right-hand column shows the funds used to pay for the outlays. There is a slight excess of spending over revenues, but not by a great deal. In 2016, the cost of the Medicaid expansion is estimated to be $81 billion, and the premium subsidies account for another $77 billion. There is an $8 billion cost for additional coverage in the drug program for seniors and small-business health insurance tax credits. The total is $166 billion of new commitments. To put these numbers in perspective, the Medicare program is expected to spend about $700 billion that year, and federal Medicaid spending (without the coverage expansions) would be about $300 billion. In the overall scale of federal commitments, the coverage provisions amount to about 4 percent of federal government spending. There are ways of offsetting these costs, and the Affordable Care Act employs many of them. High-income families can afford to pay for some of these expenses. Accordingly, the Act increases the Medicare Hospital Insurance tax on very high earners-a change that will generate $33 billion in revenue in 2016. Further, it increases the estimates of productivity growth expected in the hospital industry (thus justifying less rapid payment increases), reduces overpayments to private plans that enroll Medicare beneficiaries, and makes various other changes to reduce spending on existing public health programs. All told, this yields $159 billion in 2016. The net amount is enough to offset the costs of additional coverage. The Affordable Care Act is thus paid for. But savings of this magnitude are not easy to obtain. Lowering Medicare payments without similar changes by private insurers will create a fee differential between Medicare and private insurance that would, over time, cause providers to leave the Medicare program. We have seen exactly this effect in Medicaid, where most providers will not accept enrollees who are in the program because payment rates are so low. Nor does paying the bill once end the problem. The trouble with coverage costs is that they increase over time more rapidly than the revenues used to pay for them. Tax revenue rises with output, roughly at the rate of gross domestic product (GDP) growth. Historically, medical care costs have increased about 1.5 to 2.0 percentage points more rapidly than GDP. When spending rises more rapidly than revenues, programs become unsustainable. Absent other policies, Medicare, Medicaid, and exchange subsidies would soon outstrip our financing ability. Figure 1 shows this situation. It is estimated that without a change in the rate of increase in medical care costs, the entirety of federal revenues would go to support health care and Social Security by the middle of this century, with no money left for defense, environmental programs, education, interest on the debt, or the myriad other activities of the federal government. The vast bulk of this dire scenario is attributable to rising health care costs. Of course, these costs need to be weighed against the benefits of covering everybody. Medical care is so expensive and so necessary for a fulfilling life that universal health insurance coverage is clearly the right step. My point is not that coverage is unaffordable or even that it will become unaffordable; rather, the point is simply that addressing the access gap is not enough. We will be able to maintain our commitment to universal coverage only if we can solve the cost part of the equation. Concern about access involves more than just whether a person has insurance coverage today; it incorporates how insurers will make pricing and coverage decisions in the future. For insurance companies, covering the healthy is much more profitable than covering the sick. When paid the same amount for everyone, the smart insurer will always choose to cover people who use less care; for the same money coming in, less goes out. The consequence is an unfortunate dynamic: insurance companies roll out the red carpet for the healthy but dump the sick. The minute a healthy person becomes ill, the carpet disappears, and the person is encouraged to go elsewhere. Of course, no one wants to be insured only when healthy. The whole point of insurance is to be secure when illness arises. Thus, the hot potato game of passing off the sick is as inefficient as it is unsettling. In economic parlance, this process is termed "risk selection," and it is one of the pathologies of insurance markets. This same dynamic explains why people find it hard to identify good insurance plans, even when they are in good health. Insurers do not reach out to people readily, like sellers of other goods. Rather, they wait in reserve, checking whether the person is profitable to insure before offering a policy. Their mentality is: don't encourage people to sign up for insurance unless you know they are healthy. This makes it difficult to comparison shop. Addressing the insurance runaround is straightforward-at least conceptually. We can simply order insurance companies not to deny coverage to the sick. By requiring that insurers cover the sick on equal terms with the healthy, we can prevent people from being tossed aside when they need care. Further, we can require insurers to post their rates for all to see and allow people to choose freely among different insurers. The most popular parts of the Affordable Care Act do exactly this. They require insurers to take all comers (termed "guaranteed issue"), prohibit rescinding coverage when people get sick ("guaranteed renewability"), limit premium variation between the healthy and sick ("modified community rating"), and ban lifetime limits on coverage. The law further requires states or the federal government to set up an online insurance exchange allowing people simpler access to insurance. Plans that want to sell to people would apply to the exchange, with rates essentially the same for all. None of this is novel. It builds off regulations that many states have already enacted and enforce. Even insurance companies were not surprised to see these regulations. But there is a catch: implementing these regulations can have unintended consequences. Allowing sick people to get coverage whenever they want invites healthy people to postpone obtaining coverage until they really need it. Why buy coverage when you are not in need, if you can get it the moment you fall sick? If the healthy people drop out of the market, however, the rates for the rest must rise; no insurer can cover the average price of the most expensive people while charging premiums that are below their cost. When rates rise, this encourages still more people-the healthiest of the remainder-to drop out as well. The net effect is a "death spiral"-fewer and fewer people covered at higher and higher prices. Without a mechanism to stop this dynamic, regulation creates severe problems. The only way to make insurance regulations work is to ensure that almost all people are covered almost all of the time-in sickness and in health. Some economists assert that insurance regulations should not even be attempted unless healthy people are required to buy coverage. The Obama Justice Department took this view when the U.S. Supreme Court was considering the constitutionality of the requirement to buy coverage in the Affordable Care Act. It suggested to the court that if it struck down the requirement that all individuals buy health insurance, it also needed to strike down the regulations that require insurers to sell to everyone on a fair basis. Others believe the situation is not so dire, that with generous subsidies we can prevent the insurance market from unraveling. In the end, the Supreme Court upheld the requirement that all individuals buy coverage, so the issue of whether the insurance regulations needed to be struck down was moot. What all agree on is that for regulation of insurance coverage to be successful, insurance must be generally affordable. Thus insurance reform directly links to the issue of premium subsidies; we can't attempt one without the other. And that brings us back to the costs of those subsidies. In health care, all roads lead to costs. And those costs are big numbers. The average American spends $8,000 annually on medical care-including the amount individuals pay out of pocket, the amount that insurers (or employers) pay for them, and the amount that governments collect as taxes to support public health care programs. As Figure 2 shows, this is over twice the average of other rich countries. Since the United States is richer than other countries, it ought to spend more on medical care. But income alone does not explain these differences. Even as a share of income, medical spending in the United States is 50 percent higher than in other countries. Medical care used to be much less expensive. In 1960, medical spending per person was about $900 (adjusted for inflation)-only one-tenth as much as today. As Figure 3 shows, in 1960, U.S. spending as a share of GDP was relatively comparable to spending in other countries (only 10 percent higher). In the past five decades, spending on medical care in the United States has exceeded the growth of the economy by nearly 2 percentage points annually. While growth in medical spending has exceeded GDP growth in all countries, the gap has been larger in the United States than elsewhere. The result is a growing divergence in spending between the United States and similarly rich countries; the gap in 2007 was 55 percent. Most estimates suggest that this differential between medical spending increases and GDP increases will continue over time. The Congressional Budget Office and the actuaries at the Department of Health and Human Services believe that growth in health care costs will exceed income growth by 1 percent or more for the indefinite future. Notice the emphasis on total medical spending, not just Medicare or Medicaid. Costs for both public and private medical care programs are rising over time, at approximately the same rate. The United States has a problem with medical care costs, not solely a problem with government program costs. The consequences of growth in spending on medical care exceeding the growth of the economy are profound. Tax revenue rises with the growth of the economy. If medical costs increase more rapidly than economic growth, it means there is a growing burden on the government. The burden is more acute in recessions than in expansions, but it never disappears. At the business level, sales for the typical firm are increasing approximately with the growth of the economy. Thus, when medical care increases more rapidly than GDP, employers encounter financing difficulties with their health plans. Almost always, these costs are passed back to workers, whose cash wages increase less rapidly than their productivity. Families then feel the squeeze of rising medical costs from all directions: higher costs for health insurance, increased copays at the doctor's office, smaller increases in take-home pay, and tax dollars that increasingly go to health care and away from education, public works, environmental protection, and other areas. The major issue is whether this spending is worth it. Is the money we increasingly put into medical care valuable or not? And if the money is not worth it, how do we do better? The value proposition, as economists term it, is the most important question in all of medical care. I turn to it next. In the United States, the soaring cost of health care has become an economic drag and a political flashpoint. Moreover, although the country's medical spending is higher than that of any other nation, health outcomes are no better than elsewhere, and in some cases are even worse. 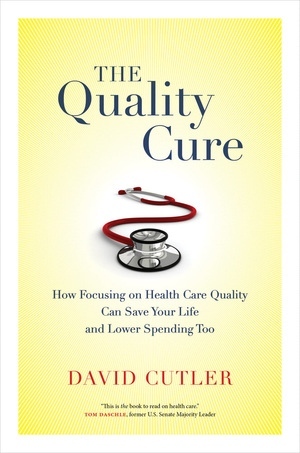 In The Quality Cure, renowned health care economist and former Obama advisor David Cutler offers an accessible and incisive account of the issues and their causes, as well as a road map for the future of health care reform—one that shows how information technology, realigned payment systems, and value-focused organizations together have the power to resolve this seemingly intractable problem and transform the US health care system into one that is affordable, efficient, and effective. 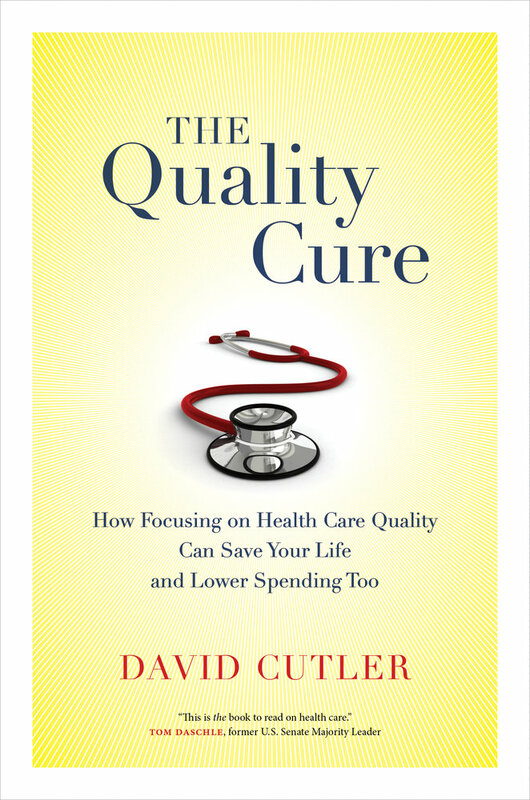 A former senior health care advisor to President Barack Obama, David Cutler is Otto Eckstein Professor of Applied Economics at Harvard University and holds joint appointments in the Economics Department at Harvard's Kennedy School of Government and the Harvard School of Public Health. He is the author of Your Money or Your Life: Strong Medicine for America's Health Care System.